(Nanowerk News) Empa researchers have demonstrated how they can adjust process conditions to influence the properties of novel plasma polymer coatings containing silver nanoparticles. Tailor-made films can be generated through a one-step plasma process. The scientists developed these new coatings, which kill bacteria while having no negative effect on human tissue, in the frame of an EU project. Silver ions are very efficient at killing bacteria, and in contrast to antibiotic drugs they are effective against hundreds of different bacterial strains thanks to different attacking mechanisms. This makes silver ideal as an antibacterial additive for, e.g., implants and wound dressings. The idea that "a little is good, more is better" cannot be adopted to silver in every case, since higher ion concentrations might also damage human cells and tissues. Therefore, surface coatings need to be made with a therapeutically useful range of silver. One possible solution is offered by the novel nanostructured polymers with integrated silver nanoparticles which a team of Empa scientists led by Enrico Körner and Dirk Hegemann are developing within the frame of an EU Project called EMBEK1 ("polymer-based, multifunctional, bactericidal materials"). In the context of this research work they investigate how varying plasma conditions during deposition influence the film structure and the associated silver ion release that determines the antibacterial effectiveness. The researchers have determined the basics for "designing" tailor-made coatings with desirable properties. 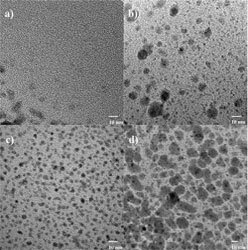 The results of this work have recently been published in the scientific journal Plasma Processes and Polymers ("Formation and Distribution of Silver Nanoparticles in a Functional Plasma Polymer Matrix and Related Ag+ Release Properties"). Left: Electron microscope images of the coatings which show the silver nanoparticles incorporated in the matrix as dark spots. 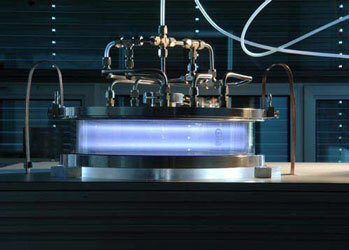 Right: A high-frequency plasma reactor in which the nanocomposite coatings are deposited on a substrate material. The Empa team used a so-called RF Plasma Reactor, in which hydrocarbon coatings can be deposited on different substrates. As raw materials a hydrocarbon gas such as ethylene (C2H4) is mixed with a reactive gas such as carbon dioxide (CO2) in order to obtain a cross-linked plasma polymer matrix containing functional groups required for cell growth. The electrical energy necessary to drive this process is supplied by electrodes. In order to incorporate silver particles firmly in the plasma layer, one of the electrodes is made of pure silver where a high voltage has to be applied for sputtering conditions. Nevertheless, the film deposition occurs near room temperature allowing the treatment of temperature-sensitive materials. The Empa scientists varied different process parameters such as the ratio of the two gases and the power input. They discovered that raising the ratio of CO2 to C2H4 leads to an increase of the incorporated amount of silver in the coating as well as to smaller, more homogenously distributed particles. Nanometer-sized, well-distributed silver particles have a significantly higher surface area than, for example, a pure silver layer. Increasing the input power also results in a higher incorporation of silver and at the same time increases the size of the incorporated silver particles. Finally, the researchers investigated the quantities of released silver ions of various coatings over different time periods. The obtained data were evaluated in context of the antibacterial and cell test results. A range could thus be determined for the silver nanocomposite coatings within they showed antibacterial properties and were yet found to be cytocompatible (i.e. friendly to cells). These results can be used to transfer the deposition process from the laboratory scale to Empa's in-house pilot plant, the first step towards industrial production of the tailor-made antibacterial coatings. In addition, the research team is attempting to create coatings with gradients in the silver concentration enabling the controlled release of silver ions over a certain time period. A polymer covering layer would thereby help human cells to grow optimally on the antibacterial coating.